Aboshi T, Nishida R, Mori N. (2012) Identification of Plasmalogen in the gut of silkworm (Bombyx mori). Insect Biochem. Mol. Biol. 42: 596-601. Humphrey JM, Chamberlin AR. (1997) Chemical synthesis of natural product peptides: coupling methods for the incorporation of noncoded amino acids into peptides. Chem. Rev. 97: 2243-2266. Kamienski FX, Newburgh RW, Brookes VJ. (1965) The phospholipid pattern of Tanebrio molitor larvae. J. Insect Physiol. 11: 1533-1540. Kurota H, Shimada M. (2003) Photoperiod- and temperature-dependent induction of larval diapause in a multivoltine bruchid, Bruchidius dorsalis Entomol. Exp. Appl. 99: 361-369. Lambremont EN. (1972) Ether-bonded lipids of insects: A quantitative comparison of the glyceryl ethers associated with ethanolamine and choline phosphoglycerides. Comp. Biochem. Physiol. 41B: 337. Lópes-Macià À, Jiménez JC, Royo M, Giralt E, Albericio F. (2001) Synthesis and structure determination of Kahalalide F. J. Am. Chem. Soc. 123: 11398-11401. 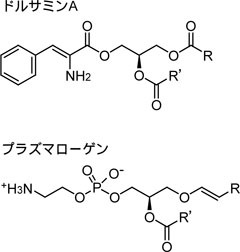 Okuno T, Ishita Y, Sawai K, Matsumoto T. (1974) Characterization of alternariolide, a host-specific toxin produced by Alternaria mali Roberts. Chem. Lett. 3: 635-638.